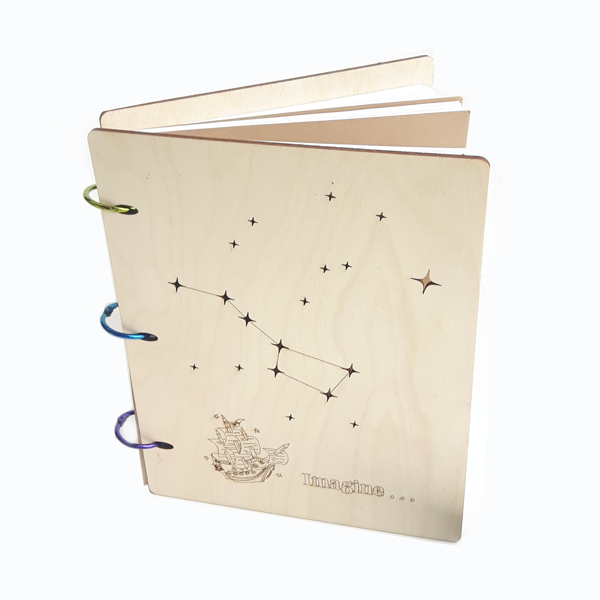 Inspired planning, organizing, imagining and writing all in one stunning hand-crafted notebook! Our signature notebook is not just beautiful and unique on the outside, it's funky and fun on the inside with a pocket, unique dividers, and even an old-fashioned library card. The back cover is engraved: '...your damn book, done.' Because you will get your damn book done! a variety of paper to make you happy. Our birchwood notebook covers are created at, and helps support, Kamloops Makerspace - a non-profit creative collaborative space that is dedicated to the entire community having access to tools, equipment, and expertise to make just about anything one might want to make! Inside content is individually hand-crafted in house. Not a writer? This is the best gift ever for your friend, the writer. Shipping fees are added at the checkout. $7.50 Canada $11 U.S. Please contact for international rate. Shipped within 10 days of order.